Together, we are raising $3,000 to build a well for children at a school in Sierra Leone, Africa, who do not have access to clean water. This makes education almost impossible. Many thanks for your support -- and don't forget to forward this to anyone who you think might want to donate too! 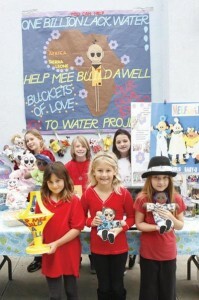 Buckets of Love, African MEE KID dolls, & Original MEE dolls, are available to purchase at the following website. As each doll is lovingly hand made with love, please allow up to 2 weeks for delivery. Please click on Malibu Times Article below. "Gratitude takes these forms: a feeling of the heart, an expression in words, and a giving in return."